Take a pan. Add cooked peas. Add salt, turmeric powder, red chilly powder, half green chillies, 1 teaspoon ginger paste and let it simmer. If it is too thick then add some water. Take a bowl. Add potatoes and mash it. Add salt, ginger paste, remaining half green chillies, cornflour and mix it well. Make small balls and slightly press it to make patties. Take a pan and drizzle some oil. Shallow fry all the patties. Keep it aside. To serve – Take a bowl. Put patties in it. 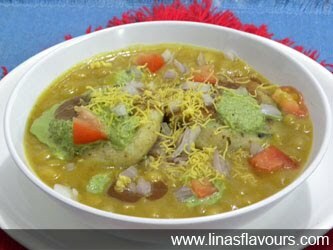 Pour some ragda, sprinkle onions, tomatoes, drizzle tamarind chutney and green chutney. Top it up with sev and serve immediately.